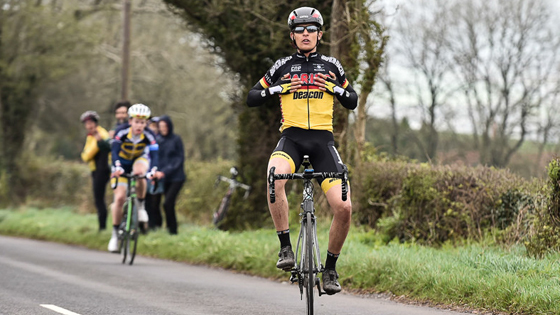 James Shaw of Haribo Beacon made it two in a row in the British Cycling Junior Road Series taking a shortened Junior Tour of the Mendips after out sprinting Matt Gibson of Velocity WD40 on the second climb of Harptree Hill. Along with Stephen Williams of NFTO Race Club, Shaw and Gibson had broken away from the peloton two-thirds of the way through the race at they went over the top of the second climb of the day at Rhodyate. The trio were unchallenged for the remainder of the race building up a one minute 30 second lead at one point. Having dropped Williams on the run-in, Shaw finished three seconds ahead of Gibson. Unexpected roadworks on both the original and the alternate courses for day one of the event meant that the organisers were forced to shorten the race to just a single stage but it was the tougher of the two stages around the Mendip Hills that survived. With heavy rain forecast for the morning, the combination of four big climbs and harsh weather looked a daunting prospect. As it turned out, the rain stayed away although fog on the summit of the climbs and a howling wind did its best to add to the challenge. The first of the climbs the long drag up Burrington Combe didnt have much effect on the pattern of the race with just a pair of riders dropped from the main group. Haribo Beacon dominant two weeks ago at the opening round again looked strong, though controlling the race and taking the King of the Mountains win. As the bunch ascended the second climb at Rhodyate they were still all together at the front although the peloton was now somewhat depleted. Again, it was Haribo Beacon riders at the front as the King of the Mountains points were awarded and, as they reached the top of the climb it was round one winner Shaw who finally made the break. He was joined by Gibson and Williams, and the three quickly pulled out a 20 second lead. As they crossed the finish line on Harptree Hill for the first time they had almost two minutes on the bunch. Shaw and Gibson broke away on the run back to the finish as the bunch also broke up and reeled in the trailing Williams. Gibson made the first move but it was Shaw who proved the stronger on the last section of the climb, easing clear on the run to the line to give himself the luxury of a celebration. Williams lost almost a minute on the leaders and Shaws team mate Joe Evans closed to within 20 seconds of him on the final climb, but the NFTO rider held on the take third place. Before heading for some well earned shelter and some warm clothes, Shaw told British Cycling: We got here yesterday and we looked at the weather forecast and saw it was going to be raining luckily that held off but either way it was going to be windy and it was going to be difficult so we just wanted to make the race as hard as we could. We wanted to be in a position where all four of us could have taken a lead role at any point. Up the first climb we took the King of the Mountain points and we got at the top of the climb into this crosswind and a group of about six of us got together and we just trammed it for about 2km. We just put everyone on the back foot, really. Riders were popping off the back and it all regrouped on the descent but some riders were suffering, some were better than others so we did our job and made it difficult, so that that was number one box ticked. On the second climb again we got the King of the Mountain points and at that point I saw the opportunity to kick over the top, so I did really dug deep, really went into the red and turned the corner into the same crosswind. I was on my own then Id got two riders chasing and then a big group of ten or eleven riders chasing again. Once the two riders Matt (Gibson) and the NFTO rider (Williams) we got working with them and the gap went out to 25 seconds pretty quickly and it stayed there for quite a time 10-12km. After that it started stretching out. I dont know why - maybe they gave up but the fog meant we were out of sight, out of sight and out of mind, maybe. After that we could get our heads down and the lads played a great role in the sense that we all made it really hard and at any point any of us could have been in the lead position, so weve got four riders that could potentially have won that race. So we played the game and I cant stress how good the guys are at fulfilling that role. At that was it as soon as we got that gap I got my head down and we went for it. I know Matts strong Ive known Matt for a couple of years, now so I know him and I respect him as a bike rider. And I made sure I didnt give him an inch because I know as soon as hes got an inch, it goes to a metre and youre not going to see him again. So coming up the final climb I made him lead it out and I knew that I was strong on the hills, so as soon as I saw the opportunity with about 200m to go I started up the sprint and just got my head down.